GRANDE PRAIRIE — The bid to become the host of the 2022 Arctic Winter Games has come down to two Northern Albertan communities: Grande Prairie, and the Wood Buffalo region. The annual games feature a wide-variety of unique sporting events competed in by thousands of athletes from across Northern Alberta, and the Canadian territories and the entire globe, including Indigenous people who live in Nordic countries as well as athletes from as far away as Russia. The games features more than 20 traditional sports and unique events from Dene and Inuit cultures, such as the Alaskan high kick, Sledge Jump and the Knuckle Hop. The success of the Games is directly related to a program that combines athletic competition, cultural exchange and social interaction. Athletic competition features sports that enjoy world-wide popularity alongside exciting northern and traditional Aboriginal events. In combination with the selection trials run by each contingent, the Arctic Winter Games are a significant part of northern sport development. The idea for the Arctic Winter Games was first thought up back in the 1960’s, when founder and former Olympian Cal Miller suggested creating a unique set of games for the North. The first installment of the Arctic Winter Games would be held in Yellowknife in 1970, with the original three contingents coming from the Yukon, Northwest Territories and Alaska. After five years however, the AWG Corporation felt the games had lost a bit of their luster, and decided it was time to expand. This is when Northern Alberta would send an “observer team” to the 1986 games in Whitehorse, to assess if they would like to join in the future. Two years later, Alberta would send 75 athletes to the 1988 games and because their participation was achieving a number of northern sport development goals, they were invited to become a permanent partner. The Arctic Winter Games would get their first mainstream media exposure in 1990, after new measures were put in place with the support of the Government of the Northwest Territories and the City of Yellowknife. The 1990 games would see enhanced competition, participation from athletes from Russia and Greenland, as well as major American network CNN ran highlights of the games. In 1994, the Government of Alberta received approval to bring athletes from the province of Tyumen in Russia to help build upon the economic exchange programs between the two governments. After the 1994 Games it was then decided that the Russian teams would have to fund themselves completely, if they wished to continue to participate in future Arctic Winter Games. In addition to this, it was agreed upon that if there was not at least three jurisdictions competing in a sport category during the Games, that the particular sport would be eliminated. 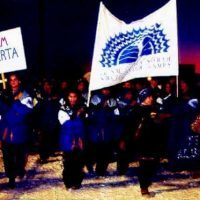 The 2004 AWC in Wood Buffalo was viewed as a massive success by all parties involved, as the 18th installment of the Arctic Winter Games would receive the most amount of media attention it’s ever gotten (from multiple countries), and would also feature two new guest units: The Sami People from Northern Scandinavia, and Province of Yamal, who replaced Chukotka for these games. The 2010 Arctic Winter Games in Grande Prairie, Alberta welcomed 2000 Athletes, Coaches and Mission Staff as a new community joined the Arctic Winter Games family. Much like Wood Buffalo, the games would be proclaimed a major success in the region, with the government of Alberta citing that 7.2 million dollars was brought in during the 24th installment of the games. Grande Prairie co-chair Owen Lewis said earlier this week that since 2010 the town has built new infrastructure as well as cultural attractions, with the community also adding several state-of-the-art swimming pools and other facilities such as the Eastlink Centre and Philip J. Currie Dinosaur Museum. Lewis would also note that GP wouldn’t need to construct any additional buildings in order to host the opening ceremonies, while Wood Buffalo would. The decision for 2022’s AWC host could come very soon.